Q: According to reports, an official from the US Department of State said on March 2 that some sub-Saharan African countries received low-interest loans from China and other countries, which has left them debt-ridden. 50 percent of these loans came from China. Countries like Russia, China, Iran and the DPRK have taken out resources from Africa but relevant African countries have not made much progress in their development. What's your comment? A: This statement is completely inconsistent with the fact. Presently, the debt owed by some African countries was accumulated over a long period of time instead of occurring in recent years. China is not a main creditor of African countries. Financing support is indispensable for any country that is at the stage of economic takeoff, especially the initial stage of industrialization. Without financing, it would be difficult for African countries to achieve industrialization and modernization. China's financing support to Africa is mainly invested in infrastructure construction and the field of production. The Chinese companies have built a large number of infrastructure projects such as highways, railways, ports, airports and communications facilities in Africa, which greatly improved the environment for Africa's economic development, added to its appeal to foreign investment and enhanced its capability to achieve self-driven development. In addition to loans, the Chinese government is more inclined to encourage and guide Chinese enterprises to increase their direct investment in Africa and has offered support in this regard, and actively explores new investment cooperation model such as the Public-Private Partnership (PPP). I would like to stress in particular that China always attaches high importance to Africa's debt sustainability. We are committed to intensive development. The large infrastructure projects are planned and moved forward along with promoting Africa's industrial development. While pursuing the economic and social benefits of the relevant projects, we have also laid emphasis on enhancing African countries' capability for independent and sustainable development so as to avoid adding to African countries' debt burden. China welcomes the concerted efforts made by the international community to support Africa in achieving peace, stability and development. We hope that relevant countries can earnestly contribute more to Africa's development and view China-Africa cooperation in a fair and objective way. Q: According to reports, the US aircraft carrier yesterday started its first visit to Vietnam since the end of Vietnam War in 1975. Is China concerned about that? Do you have any comment? A: We have no problem with relevant countries developing normal relations and conducting normal cooperation. Meanwhile, we hope that the relevant cooperation can contribute to regional peace, stability and prosperity. Q: Recently, certain countries criticized Pakistan for falling short in cracking down on terrorism financing. Besides, there is sensationalization that China does not 100 percent approve of Pakistan's efforts to combat terrorism financing. Does China agree with this? What's your comment? A: The Pakistani government and its people have contributed and sacrificed enormously for the fight against terrorism. In recent years, Pakistan has made important headway in actively strengthening financial regulations to combat terrorism financing. All relevant parties should view Pakistan's counter-terrorism efforts in an objective and fair way, instead of just pointing fingers at Pakistan. We also oppose using finance as a political means to impose pressure on Pakistan. As an all-weather strategic cooperative partner for Pakistan, China will continue to enhance coordination and cooperation with Pakistan on counter-terrorism. The two sides enjoy impregnable political mutual trust and any attempt to drive a wedge between China and Pakistan is doomed to fail. Q: According to reports, on February 23, China has put a hold on a US request to the UN Security Council Sanctions Committee on the DPRK to ban 33 ships which violated the Security Council's sanctions on the DPRK from ports around the world and block 27 shipping firms for helping the DPRK circumvent sanctions. Can you confirm that? Do you have any further details on why China put this hold on the request? A: According to my information, the listing proposal submitted to the relevant Sanctions Committee of the UN Security Council mentioned by you involves a large number of entities and ships and we need some time to carry out inter-departmental study. It is due to technical reasons that China put a hold on the relevant listing proposal. We will make decisions in accordance with the requirements of the relevant resolutions of the UN Security Council and on the basis of the facts. Q: According to reports, Japan's Ministry of Education, Culture, Sports, Science and Technology recently issued an amendment to the curriculum guidelines to instruct high schools to teach students that Diaoyu Dao is Japan's "inherent territory" without territorial disputes. What is your comment? A: The Chinese side has lodged stern representations with the Japanese side on the above-mentioned situation. Diaoyu Dao and its affiliated islands have been China's inherent territory since ancient times. China's resolve and determination to uphold its territorial sovereignty are unwavering. Whatever Japan says or does, the fact that Diaoyu Dao belongs to China cannot be changed. We solemnly urge Japan to face squarely history and reality and educate the young generations with a correct view on history, thus avoiding creating new obstacles to China-Japan relations. Q: Reports say that the USS Carl Vinson yesterday started its visit to Vietnam. What is China's position on this? We have no problem with relevant countries developing normal relations and conducting normal cooperation. Meanwhile, we hope that the relevant cooperation can contribute to regional peace, stability and prosperity. Q: Some African countries still have the so-called "diplomatic ties" with Taiwan. What effort has China made to win back these African countries and establish diplomatic relations with them? A: The one-China principle is the widespread consensus of the international community and adhering to this principle also represents the trend of the times. 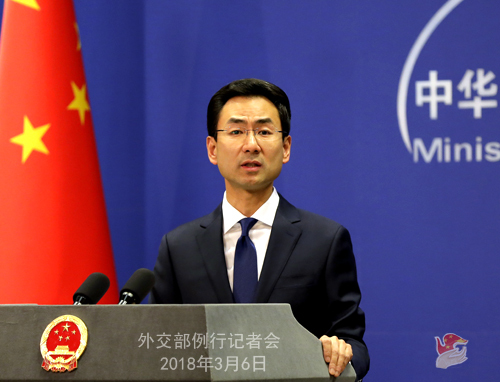 China is willing to develop friendly relations and conduct cooperation with all the other countries around the world on the basis of the Five Principles of Peaceful Coexistence. Q: According to reports, the DPRK leader Kim Jong-un "unusually" met with the special delegation sent by the ROK to Pyongyang and said that the two sides will write a new chapter of national reunification. The Korean Central News Agency said that the US should not make misjudgment on DPRK's willingness to hold negotiations with it. What is your comment on this? 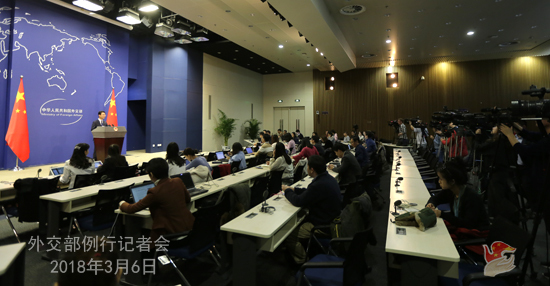 A: Just as I said yesterday, the ROK sent a special delegation to the DPRK to exchange views on relevant issues and China believes that this is good news. We have also noted the positive media reports on the ROK special delegation's visit to the DPRK. China always maintains that the DPRK-ROK interactions should bring about the ones between all relevant parties, including between the DPRK and the US and the dialogue during the Pyeongchang Winter Olympic Games should continue as a regular one, and that the efforts to improve the DPRK-ROK relations should lead to the concerted ones that will realize the denuclearization and achieve the lasting peace of the Peninsula. 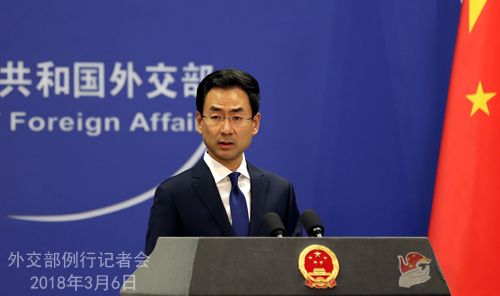 China stands ready to make efforts and play a positive role to this end.